The Colored American was among 40 black newspapers published before the Civil War. 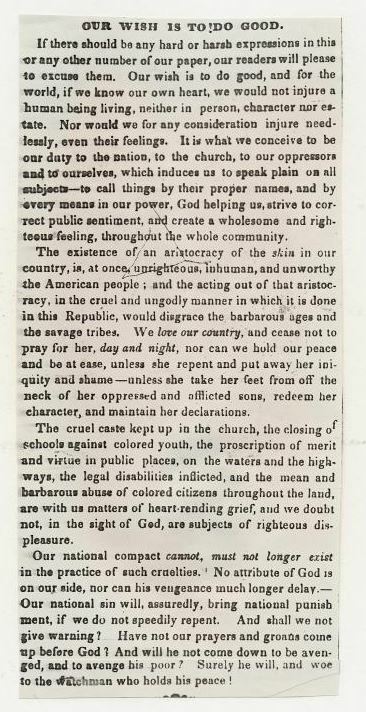 Although it’s first issue was available in March of 1837, it was the July 7, 1838 (shown here), issue that offered a pointed expression of its purpose and direction. Like all such newspapers in circulation at the time, the Colored American offered a way to keep people connected and informed. It offered them a voice and a platform for debate when no other resource was available. And though various sources disagree on the years of its publication (originally from 1837 to 1842), it made a significant impact on those who would fight for freedom. In the article shared here, the writer informs his readers that the newspaper’s intention is simply “to do good in the community and to assist an oppressed segment of society.” There were always disagreements and debates, both political and ethical, even in this tightly knit group of people. The newspaper offered the perfect way to present both sides of issues to encourage readers to draw their own conclusions and make informed choices. And while the readership consisted mostly of free, literate African Americans, both the free and the enslaved were affected by the topics addressed in the articles.